That from-birth affinity for vibrant fruit that makes your eyes water and your lips pucker draws a large crowd of my dad’s compatriots and their families from Worcester, MA to the Hudson River Valley one Saturday every year to pick the fruit of their homeland. The men (it’s mostly men) take home crates and crates of the ruby jewels and add them to rice dishes, cook them down into jam, and, of course, preserve them in syrup for Sharbat’e Albaloo, a refreshing sour cherry drink. My dad and I took home modest amounts and instead just ate them out of hand, no matter how acerbic they were that particular year. It was with some of these New York cherries that I made this pie—a favorite. I went on the journey to New York with my dad just once when I was young, carrying nothing more than my bathing suit and a bag of cheese puffs—there would be an impressive barbecue, swimming, and sports after cherry-picking. Somehow on this trip I got a rock thrown at my foot by another kid and cherries, that stained my favorite tee-shirt, thrown at my back by a tricky adult; but, it is still one of my most vivid, happy memories. Maybe my adult love for sour cherries comes from an inherent connection to the fruit, or from the time I spent with my dad, which was much more limited than that which I spent with my mom, whose schedule was more flexible. It was an adventure: carpooling with family friends; spotting deer in front of the car (that was probably less exciting for the one driving); jumping from rocks into murky water that my mom would probably never let me splash in; water snakes (!!! ); open space for barbecuing kebabs to juicy, charred perfection; Frisbee and whiffle ball. Many of these things were lacking from my Central Mass childhood. Sour cherries are hard to come by in Eastern Mass, my current home, though I do know a coworker has a tree. Sweet cherries are deliciously snackable, and good for some baked things, but the sour variety will forever be my dessert cherry of choice. And with no leads this year, I would have to make my cherries sour myself, damnit. I would quick-pickle them. Lovely served with pork or lamb or cheese, pickled cherries have lots of uses and are a great way to preserve July-perfect sweet cherries. And they work well in desserts. The same batch you see here also went into some lovely almond muffins. They boast a BIG vinegar punch, flavored tastefully with some rosemary and pink peppercorns. I am an acid fiend, but I’d even say that these cherries might need some more water added to the mix if they’re being used only to be snacked on or thrown on salads. 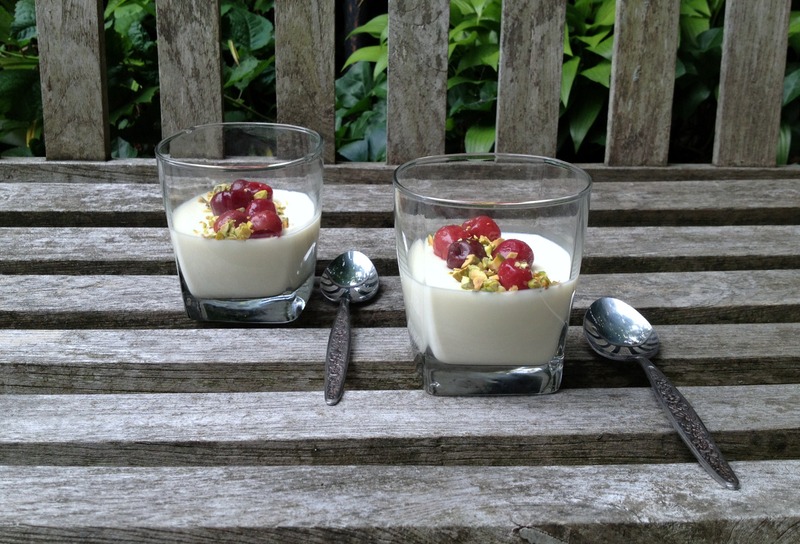 But when topping super creamy, not-too-stiff white chocolate panna cotta, they’re perfect. The smooth richness of the white chocolate tempers the vinegar’s acidity. The white chocolate also naturally pairs well with the subtle rosemary and pink peppercorns flavors. To keep the panna cotta light and summery and to add some tang, I use buttermilk for some of the traditional heavy cream. I rarely use white chocolate (well, unless it’s caramelized), but desserts like this remind me that the ingredient can serve an important purpose. This is not a white chocolate dessert. It’s a dessert that utilizes white chocolate as a balancing agent. It’s not likely that any dessert (cherry or otherwise) would trump sour cherry pie for me. But sometimes you’ve got to work with what you’ve got and this pickle-dessert combination, though a little fancy-looking, quietly reminds me of that very un-fancy day picking cherries and eating cheese puffs. If you’re going to unmold the panna cottas, grease the dishes. 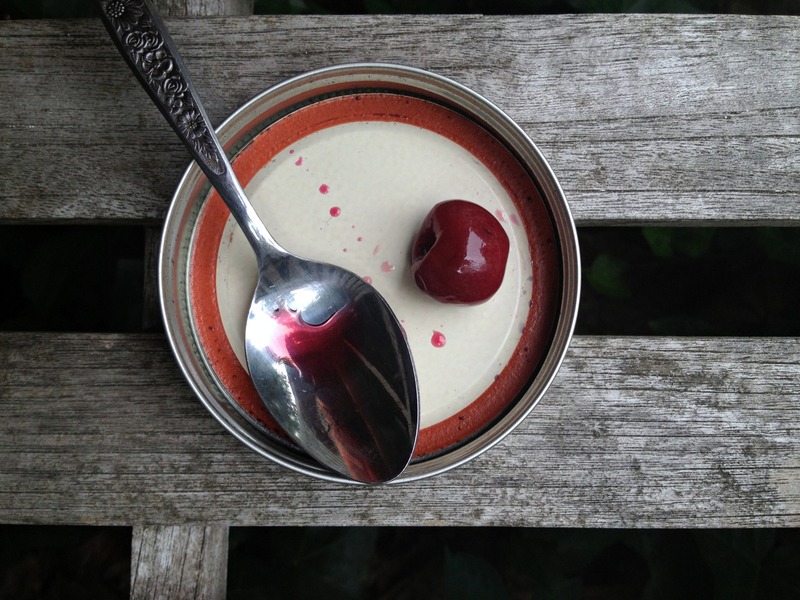 If you’re garnishing the panna cottas with whole pickled cherries, drain them of extra liquid. 1. For the Pickled Cherries: Place cherries in medium bowl. Bring vinegat, sugar, water, rosemary, pink peppercorns, and salt to boil in small saucepan; cover, reduce heat to low, and simmer mixture for 10 minutes. Pour brine through fine-mesh strainer into bowl of cherries. Cover surface of cherry mixture with plastic wrap, making sure all cherries are submerged. Let cook completely. Transfer cherries to jar and fill jar with enough brine to cover cherries. Seal jar and refrigerate cherries for at leat 1 day or up to 1 week. 2. For the Panna Cotta: Place buttermilk in bowl and set fine-mesh strainer on top. Bring cream and salt just to boil in small saucepan over medium heat. Meanwhile, sprinkle gelatin over water in small bowl and let sit for 5 to 10 minutes until hydrated. Scrape gelatin into just-boiled cream mixture and whisk vigorously to dissolve. Off heat, whisk in white chocolate and vanilla until chocolate has melted. Pour mixture through fine-mesh strainer and into buttermilk. Whisk to thoroughly combine. 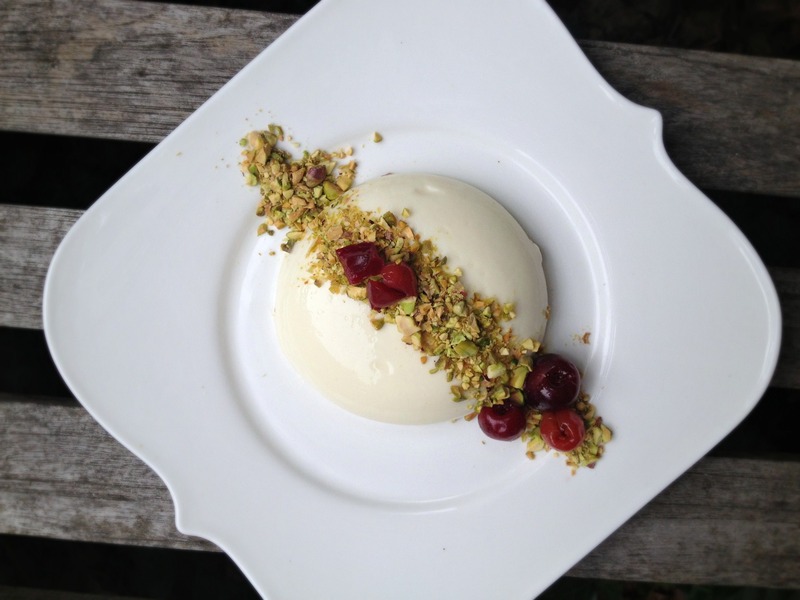 Using 4-ounce or half-cup measure, divide panna cotta among dishes. Refrigerate for at least 4 hours or up to 2 days. 3. Invert panna cotta, if desired. Chop cherries, if desired. 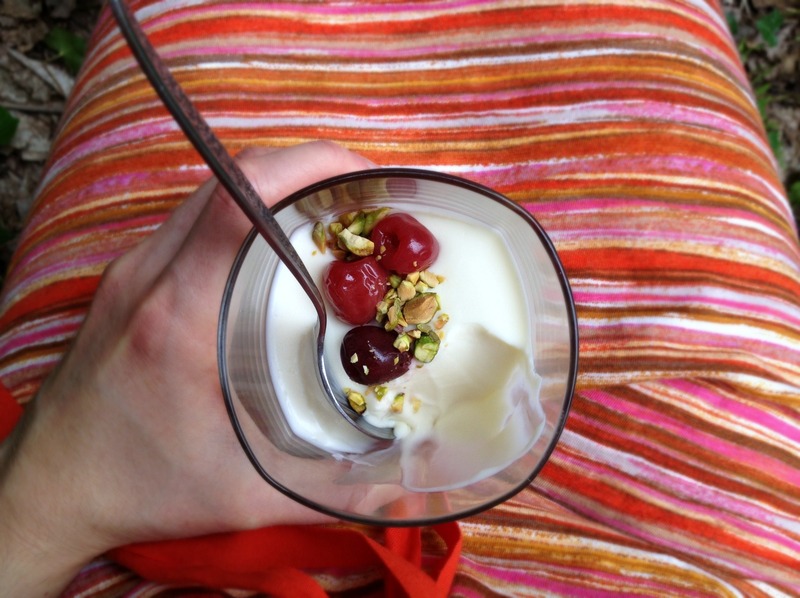 Garnish panna cottas with pistachios and cherries as desired. Serve. Simply gorgeous. Can’t wait to try. This is beautiful. I’m trying to decide how I would feel about white chocolate panna cotta. You know how much I love panna cotta. I think you would like it because the white chocolate really just adds sweetness and creaminess to the tangy panna cotta. White chocolate isn’t my favorite thing either, but I love it here. I love the way you described sour cherries and that lovely childhood memory with your dad. Now I want some sour cherries! I wish sour cherries were easier to find around here (and that they had a longer season!). I was about to write, This is beautiful, and saw that Megan wrote the exact same thing. 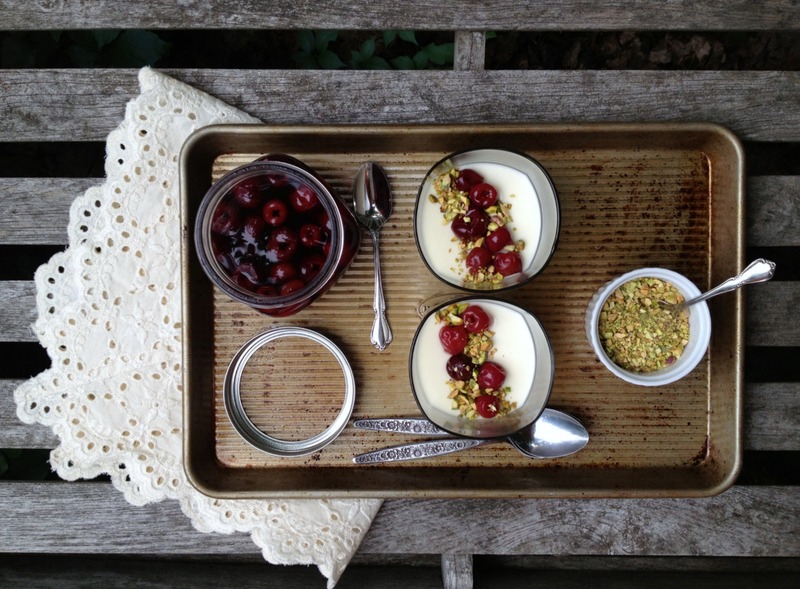 I don’t usually get very excited about panna cotta but this post definitely changed that. oh wow. this is totally my kind of dessert! i actually still have some sour cherries in the freezer from last year… what to do with them?! Lucky you! 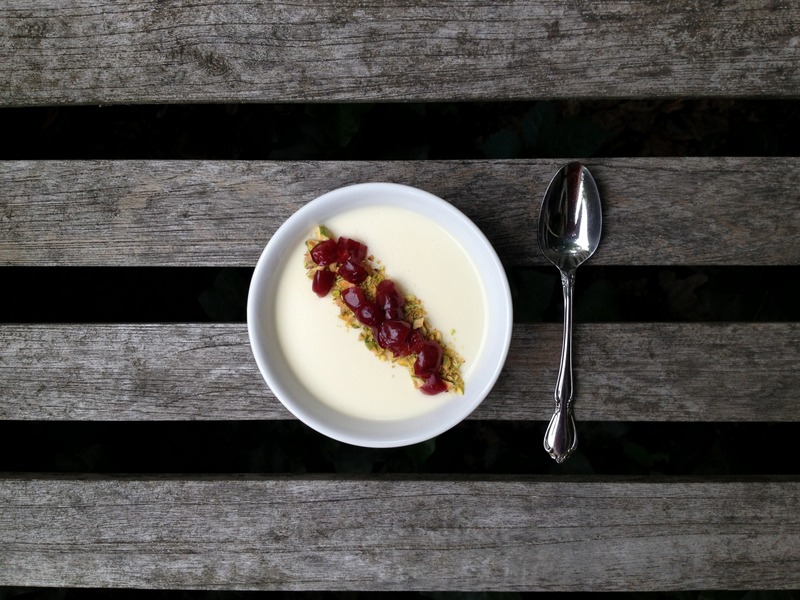 This panna cotta would be just as good if not better with real sour cherries, possibly sautéed with butter and rosemary? You wouldn’t need to pickle them to make them sour :).